Another KBeauty review here, and this time, the key ingredient is going to seem disgusting to most people: snail. Or more specifically, snail slime. Sounds so wrong, doesn't it? But you may just change your mind on that after this review. Snail slime is a pretty popular ingredient in Korean beauty, and is included in a lot of products because it apparently helps stimulate collagen production, reduce signs of photoaging, and help fade scars. Based on these specs, who wouldn't want to sign themselves up for it? I debated with buying some sheet masks with this ingredient in, but decided to go for the Mizon All In One Snail Repair Cream and All In One Repair Eyecream. Both the eye cream and repair cream come in brown apothecary style glass pots with black lids. For presentation stakes, I'd give Mizon to points. I am a sucker for apothecary style packaging, and this certainly fits the bill for the kinds of product they are. As for the products themselves, I'm a bit on the sideline opinion-wise with the eye cream. It's an eyecream. Nothing special about it really. At £18, I'd say it's mid-range price wise. You do get 25ml for this, and really need only a tiny dab for each eye, so I expect I will get bored of it long before it runs out. I would say that this is where the packaging fails. For an eye cream, I kind of prefer a tube or a small pump dispenser, purely because there's so much of it, and I'm opening up and dipping a finger in twice a day, which means it's open to the elements and bacteria. It has a shelf life of 12 months, probably for this reason, but I am still suspicious of using it a year from now. It does come with a little spoon to pick up product, but I find this a bit too much faff for me. I also can't really tell if it's doing that much for my eyes. I read that this was a do-it-all for the eyes, including reducing dark circles which is one of the main reasons I bought it, and I can't say I've seen any real difference. This one doesn't fall in my to repurchase list I'm afraid. On the other hand, I've been really getting on with the Repair Cream. Though the name is 'Cream', it's much more of a gel-moisturiser. This apparently has 92% snail slime extract, which is probably why it has such a gel-like texture. It's quite runny and goopy however, which feels rather nice during the warmer months. I've been really happy with this product though, because I've seen a definite fading in my scars. It's not a really fast effect, but considering some scars have been on my face for months, and they are now fading to the point I don't have to wear foundation and concealer over them everyday, I'm very very happy with this. It also feels fairly hydrating. I wouldn't use this as a moisturiser though, I consider this a bit more of a serum, so apply this on before moisturiser or an overnight moisture mask at night. I find I don't tend to always use this in the morning. I'll admit the idea of snail slime is not going to suit everybody's tastes or needs (I personally hate snails, so was initially freaked out when I first saw products with slime in), but considering how happy I have been with the Repair Cream, I'm glad I stepped out of my safety zone and tried it out. I'd also say it's good value for money, because for £30, I'm going to have a pot I can use twice a day and probably won't finish for nearly a year. The eye cream is something I'm less enamoured of, so I'm looking forward to switching this out once I've found something more effective. 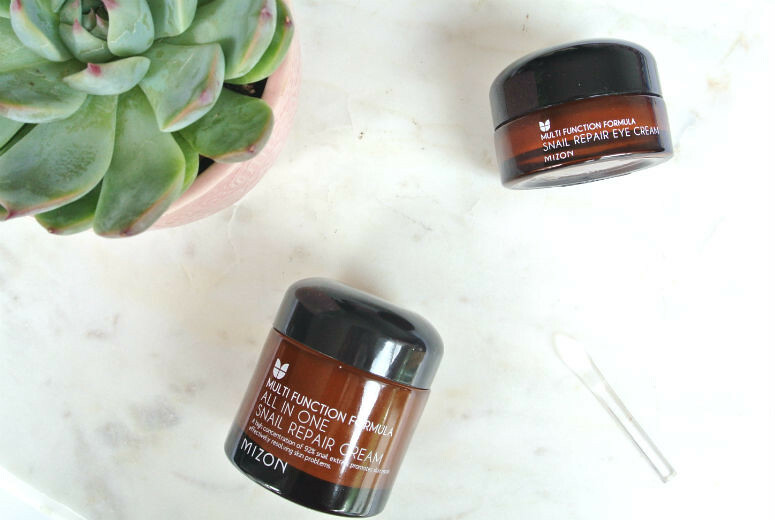 If you're looking for something that helps with scarring, and can work as a moisturiser for the whole face, then I'd recommend the Repair Cream.